Sprint PBIs/task board with drag & drop. 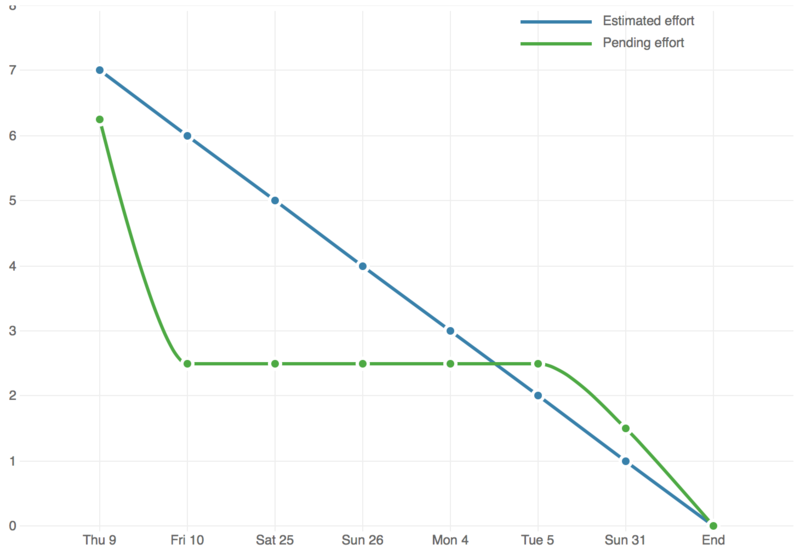 Sprint burndown chart (by effort in hours & by story points). 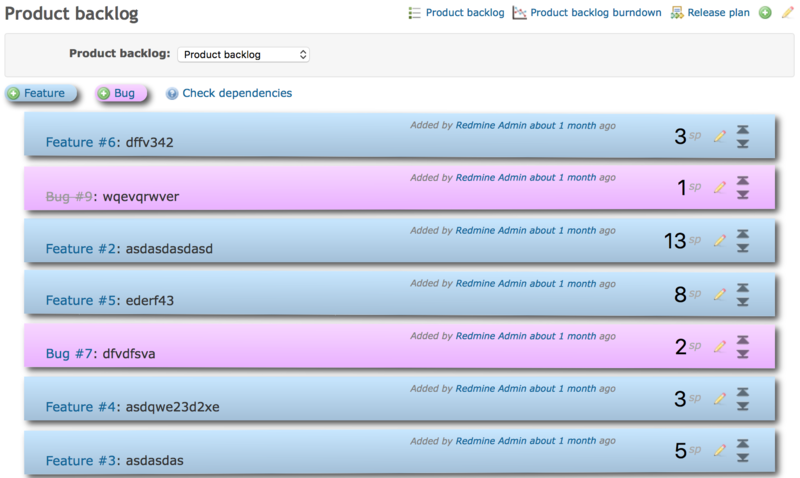 Product backlog with drag & drop (more than one product backlog per project allowed). 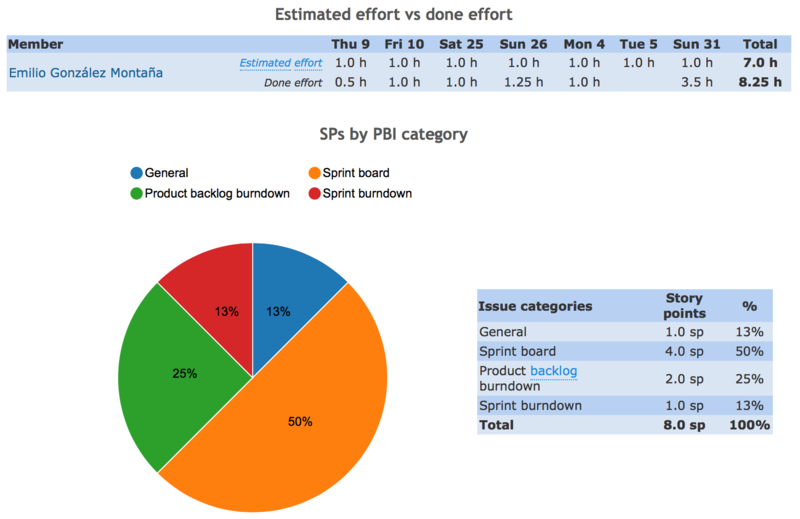 Multi-proyect support for Sprint board, Sprint burndowns, PB board, PB burndown & release plan. Edit PBIs & tasks with a pop-up directly in PB or Sprint board. Move easily PBIs along Sprints and PB. Log time directly on the Sprint board. Sprints & PB can be shared with child projects, also open & closed. General Scrum stats for project. Hints to use the plugin when something is not well configured. Easy to setup, with help dialogs in all views, plugin settings & configuration per project. Download from Files section in the plugin page (GIT clone available for Patreon supporters). Set-up plugin settings (in Admin view), review new permissions, then create Sprint & PB in each needed project settings. The best Scrum plugin for Redmine. We've been using it for over 2 years. Best RM plugin ever ! Why it does not work with redmine 3.4. Who still same issue? This plugin looks pretty sweet from what I can tell...however, doesn't seem to work on 3.4.x. Can't get plugin settings to read or save. what if this plugin add a overview of all projects, something like my-sprint, or everyones-sprint, or sprint-of-all-projects. it is helpful for a small team with lots of projects, like my team. The "no derivatives" license prevents people from improving upon this project, however other people can still "copy and redistribute...even commercially". If you are wanting to ensure the plugin remains open, the GPL or AGPL would be better IMO. best scrum plugin, just would like to select current sprint automatically rather than last added sprint. nice! expecting compatible 3.0 version! This is the best scrum plugin for redmine, It fits all my needs, I reported an issue in the drag & drop functionality and I hope this will fix in next version. Definitely the best plugin that fits my needs. Beats Scrum2b (less flexibility on trackers,) agile-plugin light by AgileCRM (too many features are to pay.) All this plugin needs is the ability for top-level items only.